One well-known "mystery" in the UFO lore involves a fireball sighting in Bolivia in 1979, followed by the discovery of two mysterious spheres. Jenny Randles wrote about this in her 1987 book, The UFO Conspiracy, pp.133-134. Most of the mystery associated with these incidents is in the practically impossible landing of these objects. The two objects were reported to be on fire, made a loud whistling sound and then exploded. However, “in the area where they’ve been found, there were no signs of the impact and it looks as though the spheres landed smoothly.” How did the spheres negotiate a smooth landing? Certainly they are not terrestrial space debris [emphasis added]. More mysterious yet, is the presence of a “silent aircraft” with three lights that appeared later the same evening, hovering above the explosion area. What was the craft doing? Who contracted it to be there and why? Was it an extraterrestrial craft or man-made? The incidents’ association with project MOON DUST intensifies these questions; what was the level of involvement of MOON DUST personnel and what did they hope to gain or hide in Bolivia? Where are the spheres today? Sorry, Mr. Wood, but the mystery is solved - and it's not extraterrestrial. 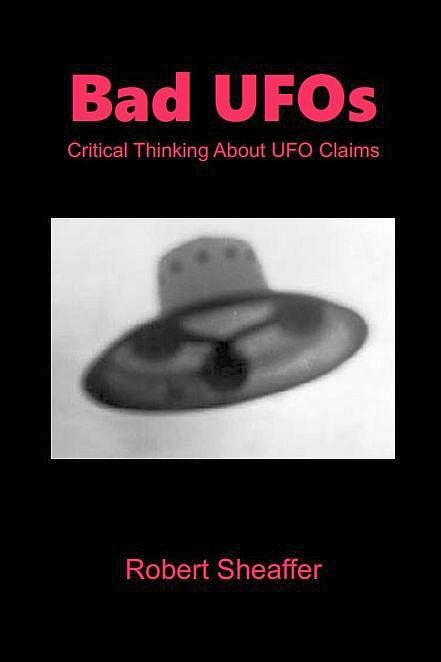 Back on April 18, I wrote about satellite expert Ted Molczan's list of visually-observed decays of satellite orbits, which at that time had resulted in 54 "unexplained" UFO cases being explained as known satellite re-entires. Well, Molczan has been at it again, and has determined that the Bolivian fireball and debris fall of August 10, 1979 was the result of the decaying orbit of "the second stage of Delta 149, that launched Westar 3 on the same day" (official designation 1979-072B / 11490), containing "two helium pressurant spheres, made of titanium." While acknowledging that we do not have "official" orbital data from NORAD for this object, Molczan notes that reconstruction of the orbit from the best available sources place the decaying rocket booster directly over the region at the time the fireball was seen. Molczan's illustration, "Approximate re-entry track of 1979-072B relative fireball sighting and sphere locations." Makes sense! When part of Sputnik fell on Manitowoc Wisconsin, the policemen that found it assumed it was slag off a truck (it was very hot). Only after a few hours (and perhaps some donuts) did it occur to them to recheck it. Obviously people in Wisconsin are not as imaginative. Contrary to popular belief, these two “mystery spheres” were the inspiration for Mel Brook’s 1987 movie “SPACEBALLS”. The thing is that logical, real-world explanations are ignored by those who want to believe. Take a look at the comments on the Westall UFO incident that was revealed to be radiation testing equipment. It's like that old maxim: when the legend becomes truth, print the legend. Ted Molczan adds that he has just discovered a confirming sighting of the fireball, reported by over 100 members of the Bolivian military. 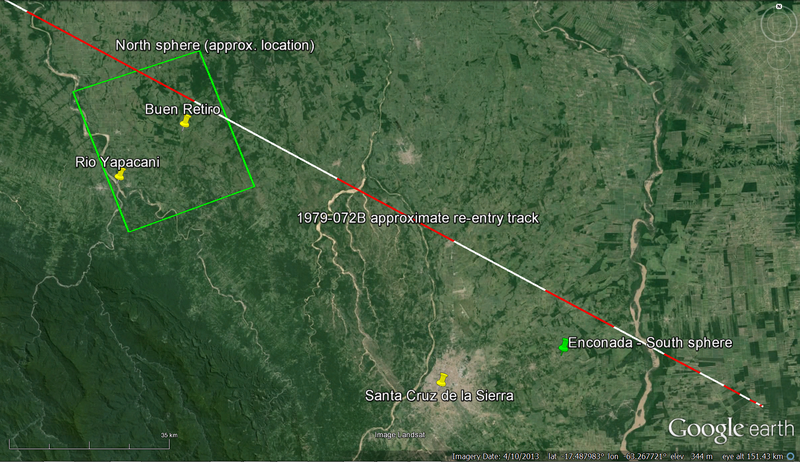 "This new evidence convinces me beyond a reasonable doubt that the Bolivian events were due to the re-entry of 1979-072B. 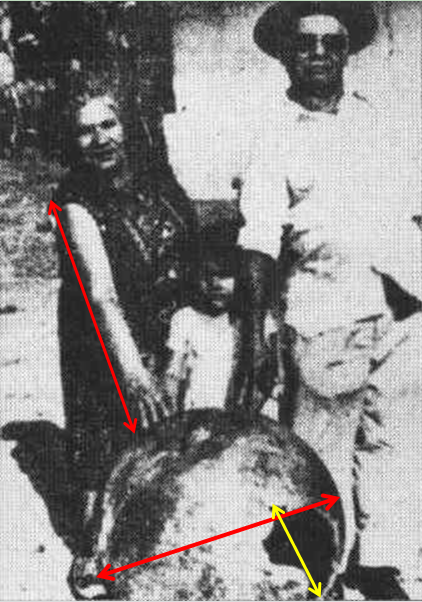 As a bonus, the little-known case of the Caquena, Chile sighting of August 10, 1979 can be considered solved." JAL 1628: Capt. Terauchi's Marvellous "Spaceship"